Conquer Valentine's Day With These Gift Ideas! With Valentine’s Day just around the corner, everyone is thinking about what to get their loved one this Valentine's Day! Whether buying for a spouse, friend, child or parent, 1-800-FLOWERS.COM, INC. family of brands has some exciting products to choose from as gifts this Valentine's Day! Whether you’re into premium chocolates from Fannie May, gourmet cookies from Cheryl’s, gourmet popcorn from The Popcorn Factory or elegant gift baskets from 1-800-Baskets.com, there’s a whole lot to love from 1-800-FLOWERS.COM, INC.’s brands this Valentine’s Day! Valentine’s Day Gift Tins from Cheryl’s Cookies are a perfect way to show love to someone special. With several festive tin themes and the ability to choose your recipient’s favorite cookies through a customizable assortment of up to 12 flavors, including NEW Dark Chocolate Cherry, this keepsake gift is sure to leave a lasting impression. 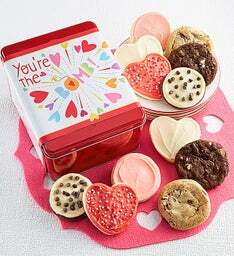 This delightful Valentine’s Day gift tin is filled with your choice of cookies! Choose from NEW Dark Chocolate Cherry, Chocolate Chip, Sugar, Honey Roasted Peanut Butter Chocolate, Buttercream Frosted Heart Cut-outs, Devil’s Food Chocolate, Buttercream Frosted Strawberry Sugar, Buttercream Frosted Chocolate Chip or Salty Caramel. Cheryl's cookies are some of my favorite cookies of all time - they just melt in your mouth! I LOVE the new Dark Chocolate Cherry cookie and you just can't go wrong with any of the flavors! Celebrate this Valentine’s Day with the perfect couple! Fannie May’s Pixies & Dixies assortment features a delicious combination of their signature Pixies and Dixies, featuring silky-smooth caramel covered in fresh pecans. These two delicious classics make for one incredible Valentine’s Day. This really is a most delicious and perfect couple!This delicious combination of signature Pixies - crunchy pecans and buttery caramel covered in rich milk chocolate - and Dixies, featuring silky smooth caramel covered in fresh pecans make such a great gift for the chocolate lover on your list! 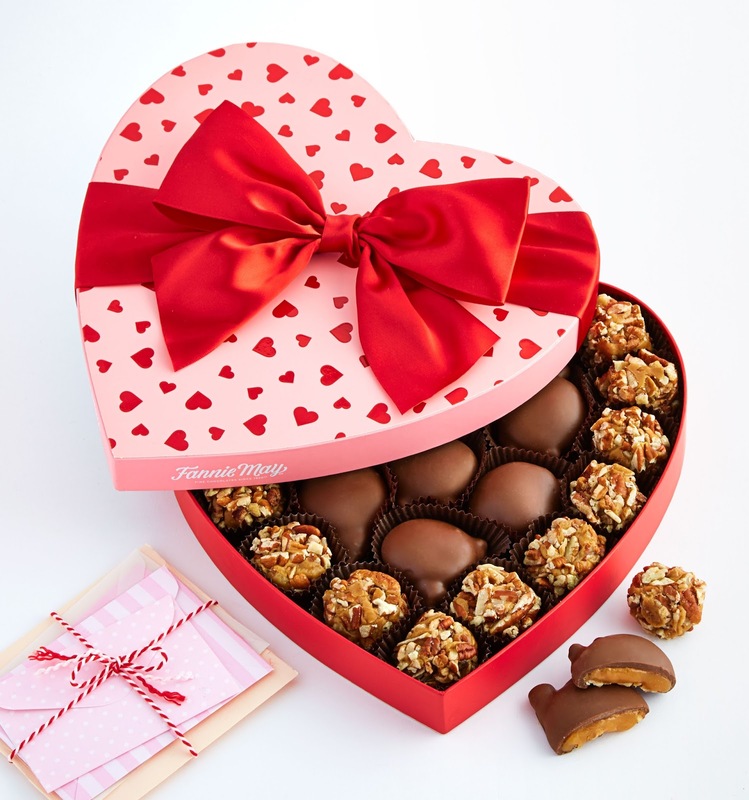 You can't go wrong with these wo delicious favorites that make one incredible valentine. Fall head-over-heels for The Popcorn Factory’s Popcorn Bites Kissing Booth this Valentine’s Day, featuring a charming kissing booth-shaped gift box filled with NEW Popcorn Bites - plump kernels of secret-recipe Caramel Corn covered in luscious milk chocolate. This brand-new gift is absolutely irresistible! This is such a fun and DELICIOUS gift for the special someone on your list! 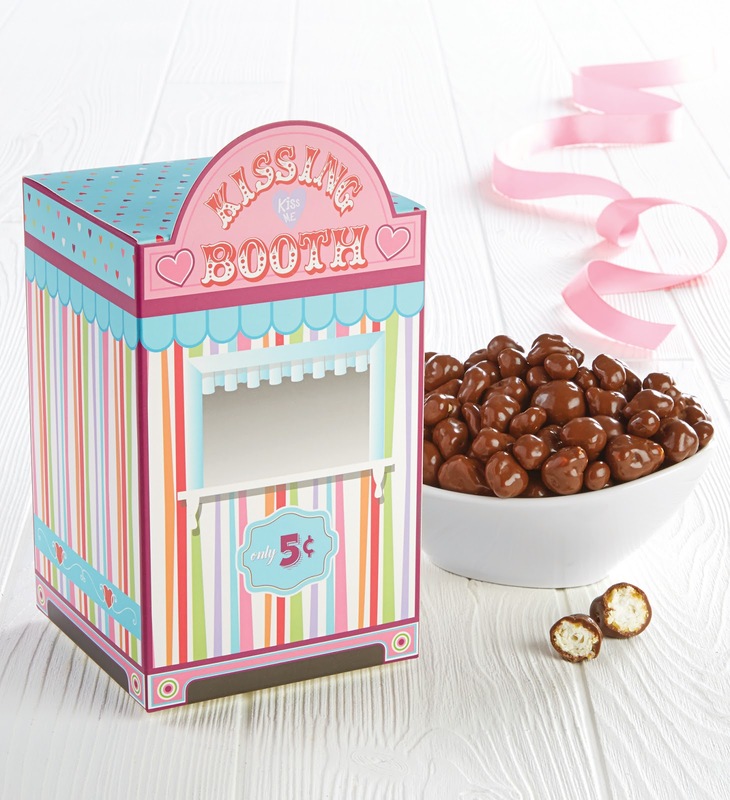 How fun to give a little kissing booth to the one you are kissing this Valentine's Day! Charm someone special with this lovable My Valentine Bear & Sweets Basket from 1-800-Baskets.com. 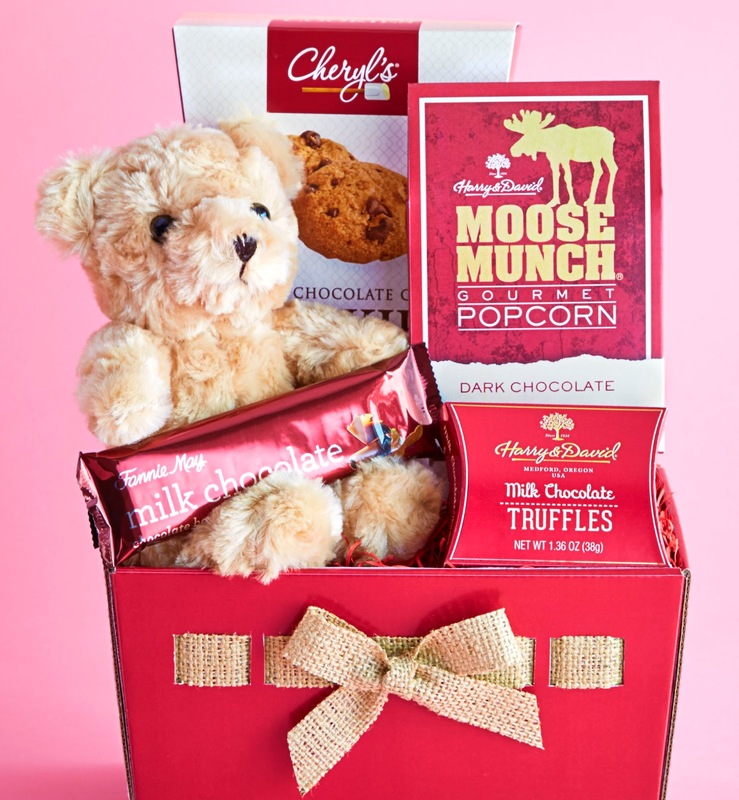 A very cute plush teddy bear is surrounded by delights from their famous brands including Cheryl's Chocolate Chip Cookies, a Fannie May Milk Chocolate Bar, Harry & David Milk Chocolate Truffles and Harry & David Moose Munch Dark Chocolate Mix. Presented in a red Valentine's box with a burlap ribbon. An adorable gift for your sweetheart, family member, college student or friend! Your valentine will be charmed by this lovable sweets basket. This makes an adorable gift for your sweetheart, family member, college student or friend!